Railway Exam Pattern Changed – Pre & Mains in RRB NTPC 2016: Railway RRB NTPC New Exam Pattern (Preliminary & Mains) has been implemented in its all upcoming and ongoing recruitment process. The Railway Recruitment Board (RRB) has introduced a big change and it is that there will be Two Stage Online exam – Pre and Mains. Those candidates clearing the RRB NTPC 1st Stage exam have been called for the Second stage mains exam to be held later. RRB NTPC 2nd Stage Exam Pattern. Dear aspirants, most of you are not aware that recently, RRB has made change in its recruitment process of all Group C (Non-Technical) posts, which will be applicable from this year including RRB NTPC 2016 examination. With respect to these change, we are getting lot of queries – what is new RRB New Exam Pattern? Railway Exam for recruitment of ASM, Goods Guard, TA/ CA, Clerk, Apprentice under Non-Technical Popular Category (NTPC) will now be a two-stage examination. It has been decided that Railway RRB NTPC (CEN 03/2015) onwards, there will be a Preliminary examination, followed by the Main exam. According to the performance of candidates in the preliminary examination, only a limited number (15 Times of total vacancy) of candidates are allowed to take the main examination. RRB NTPC 2nd Stage Exam Date is tentatively scheduled. Why RRB Changed Pattern of NTPC Exams? 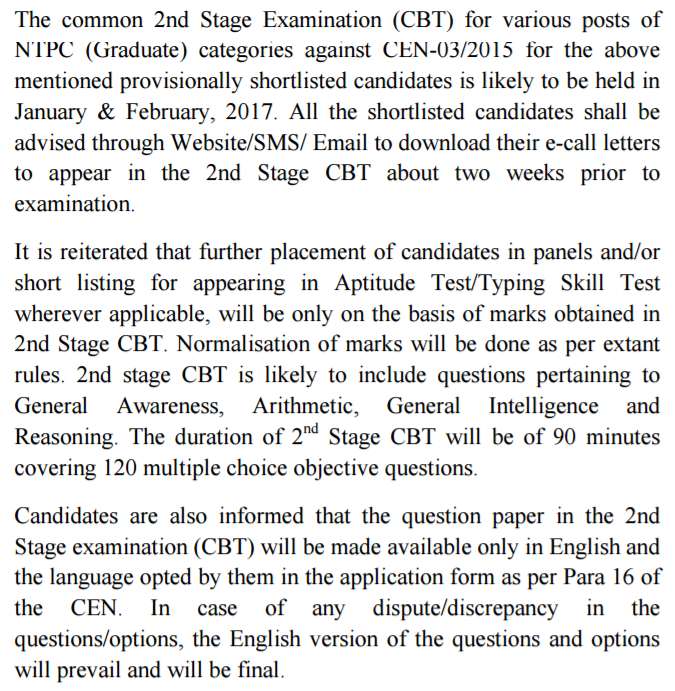 On the recommendation of a meeting held last month among all RRBs Chairmen, Railway Recruitment Board (RRB) has recently decided to change its pattern from single Stage Computer Based Test (CBT) to Two Tier online written exams. Now, 15 times more candidates of total vacant seat will be called for write another online examination. In the investigation of Special Task Force (STF), corruption has been found in Railway Online Exam 2016 in various exam centre of Haryana and Uttar Pradesh (UP). RRB NTPC Normalized Cutoff Marks released. Due to paper leakage and using of software in Railway Online Exam for NTPC 2016, The Railway Recruitment Boards (RRBs) has decided to make big changes in its exam pattern. Now there will be Preliminary Exam followed by Mains exam like SSC & UPSC exams. Candidates qualified in Railway Online exam for RRB CEN 03/2015 1st Stage CBT will also have to appear for RRB NTPC Mains Exam 2016. 1.Like SSC & UPSC there will be Mains exam in RRB. 2.15 Times more candidates will be qualified in Preliminary exam. 3.Name of Exam Center will be disclosed before two weeks of exam. 4.Name of Town of exam center will be announced before 21 days. 5.No exams will be conducted in blacklisted exam centres. 6.A special security software will be installed in all computers. Note: Second Stage Mains Exam will be held in January 2017 for RRB CEN 03/2015.